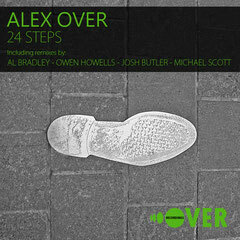 Alex Over returns on his Over Recordings label with his latest single, ’24 Steps’, backed with a host of remixes. Alex’s debut release earlier this year coincided with the launch of his Over Recordings imprint and received extensive DJ support as well as broad critical acclaim. The young DJ/producer from London had previously established himself playing at venues such as Ministry of Sound, The Lightbox and Raduno but it’s with the launch of Over Recordings that his profile has really taken off, seeing the likes of Xpress-2, Ian Pooley and Terry Francis playing his music and reviews across the globe. Now Over is back with his brand new release,’24 Steps’, a record that takes inspiration from his 24 years on the planet and the music and people that have moved him to create. The release gets going with the original version, an emotive and atmospheric track that fuses broken beats and house elements to give a very UK sound. Intricate layers of FX and edits are melded together to make a record that is both distinctive and original. The first of the remixes sees 3AM Recordings label boss Al Bradley take the reins with a mix that has a truly classic house feel to it. Built around warm bass, old school stabs and shuffling drums. Next up is Shades of Grey man Owen Howells, who delivers a deep and percussive mix with a hypnotic groove and rolling rhythms. The penultimate mix comes from Leeds based producer Josh Butler who takes time out from recent work with Darius Syrossian and Andre Crom to turn in a punchy, bass driven mix. Finally, Michael Scott is at the controls and turns in a version of ’24 Steps’ that walks the line between main room aesthetics and underground sensibilities. Out 30th July.